The Beechcraft C-45 was first designed under the name Beech Model 18, and is more affectionally known as the Twin Beech, having first flown as early as January 1937. 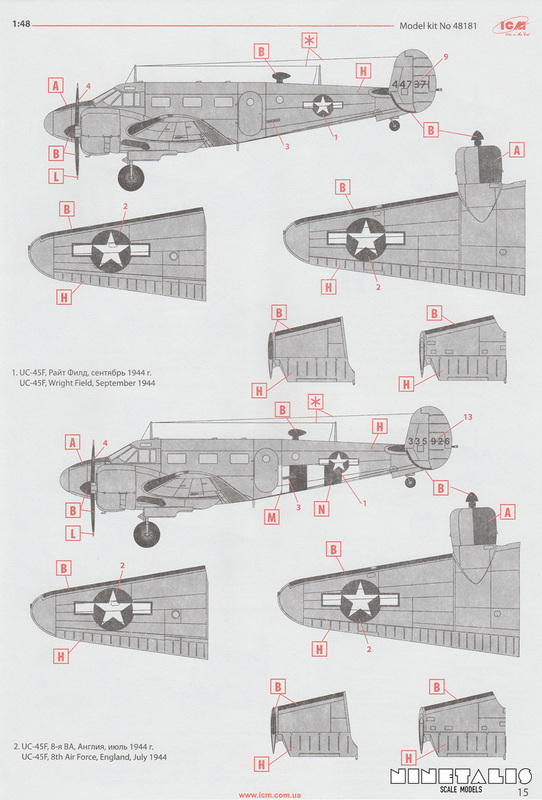 When the US was dragged into the Second World War, the US Air Force felt the need for the introduction of a light transport aircraft. Despite that only 39 Twin Beeches were build thus far, it placed an order for 1522 units of the improved C18S, which featured a longer nose. 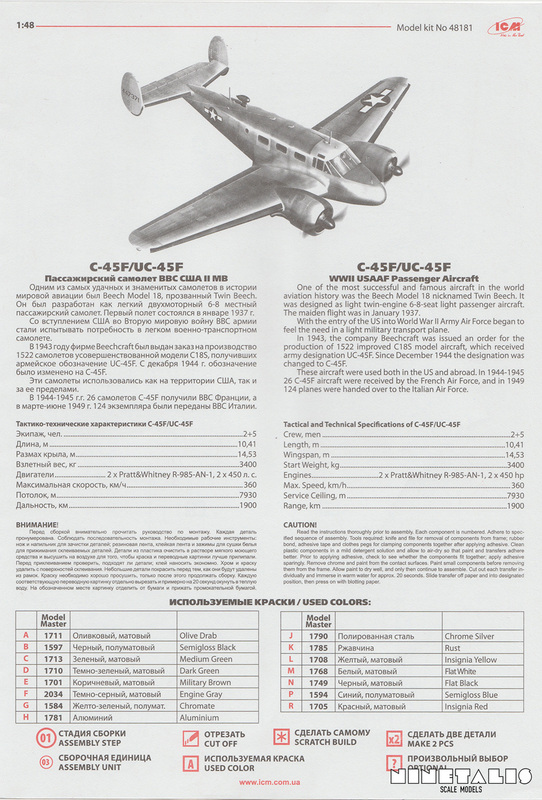 Upon receiving the new aircraft, it was granted a new designation as the UC-45F. It not only saw use in the US Air Force until 1963, but also the US Navy, as well as French, Italian, British and half the world’s other air forces which used it for a long time. Powered by two Pratt & Whitney R-985 engines, providing 450-hp each, it provided for a range of 1900km at 260km/h or 160mph and the ability for the aircraft to reach a top speed of 360 km/h or 225 mph. In total, over 9000 airframes were build in various forms over a period of 33 years. Due to its civilian nature and widespread use, many aircraft have survived until this day and many more are still in use as civilian transport aircraft. This article is partially based on information found at WIKIPEDIA, 19th june 2015. First thing first, the box in which we can find the sprues has to be one of the most sturdy ones I have seen so far. The box art covers a cardboard box that you open trough a lit on the front. Because of this the box art cover won’t become sagged when other kits are stored on top of it and you can save the box art at the start of your project, as you won’t need it to close the box when you’re not working on it. 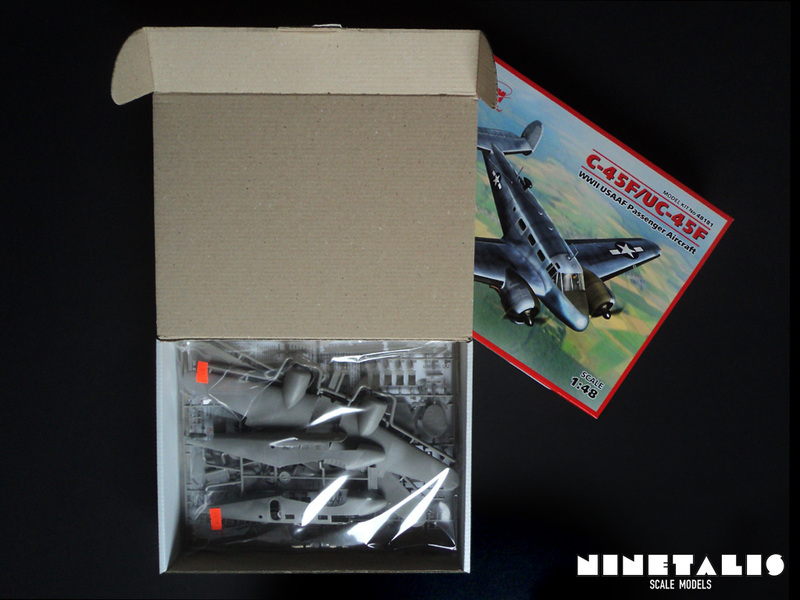 As this is not a new way of packaging, it is the first time I encounter in with a scale model kit, and I would definitely love to see more companies tackle this the same way. Inside the kit we can find a total of seven frames, carefully wrapped in plastic foil. 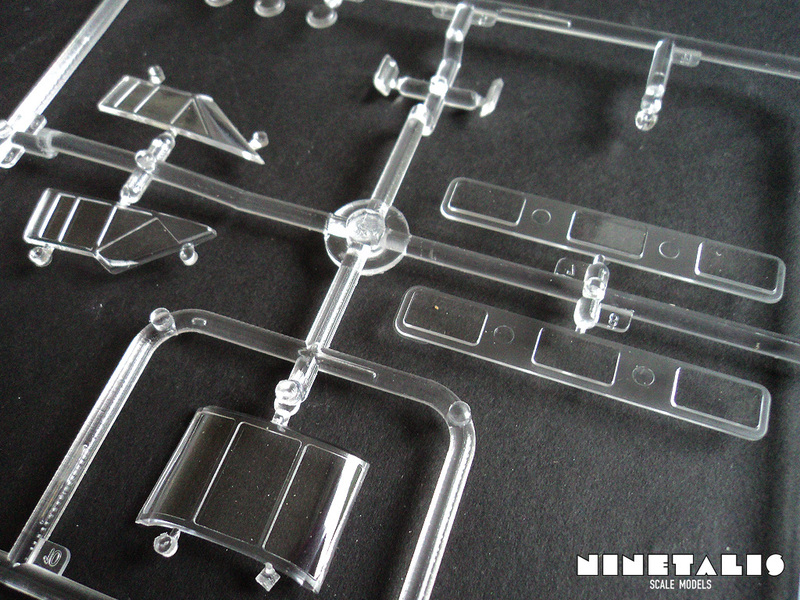 The clear sprue has been packed individually inside the foil packing all frames. 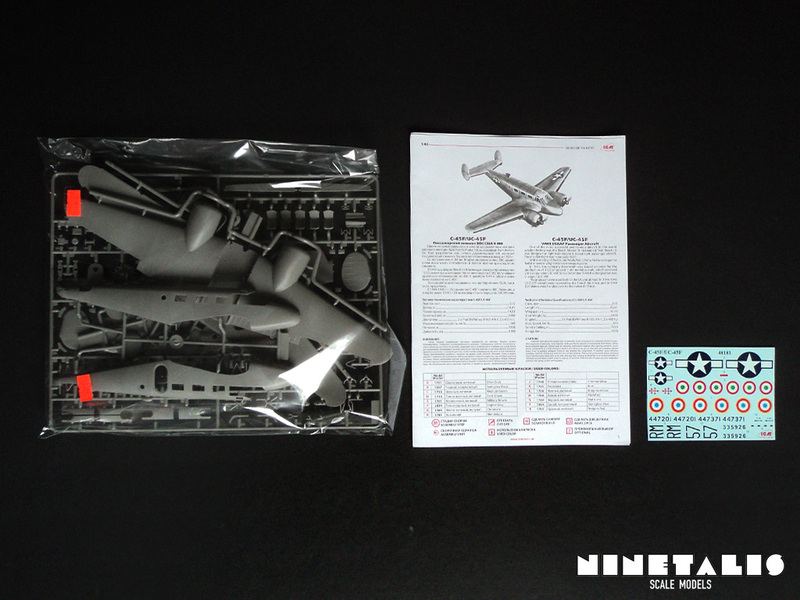 Last are the Instructions in which we can find the decal sheet, which has no sheet for protection against the paper. 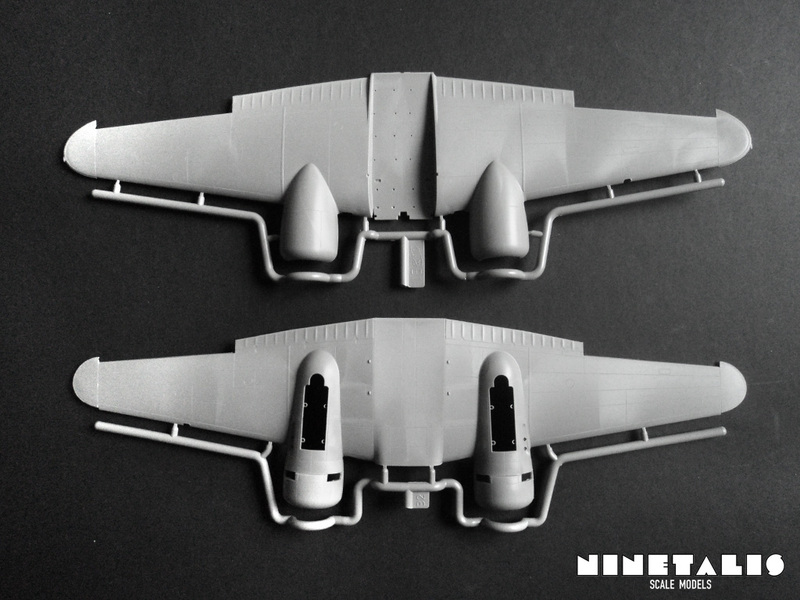 Sprue A features both fuselage halves, which feature recessed panel lines. What stands out are the antennas and pitots that are already added on left side of the fuselage. They seem to be quite firm in place and not very prone to breaking. One will have to build the kit to see how well protected these will be against damage during and after construction. 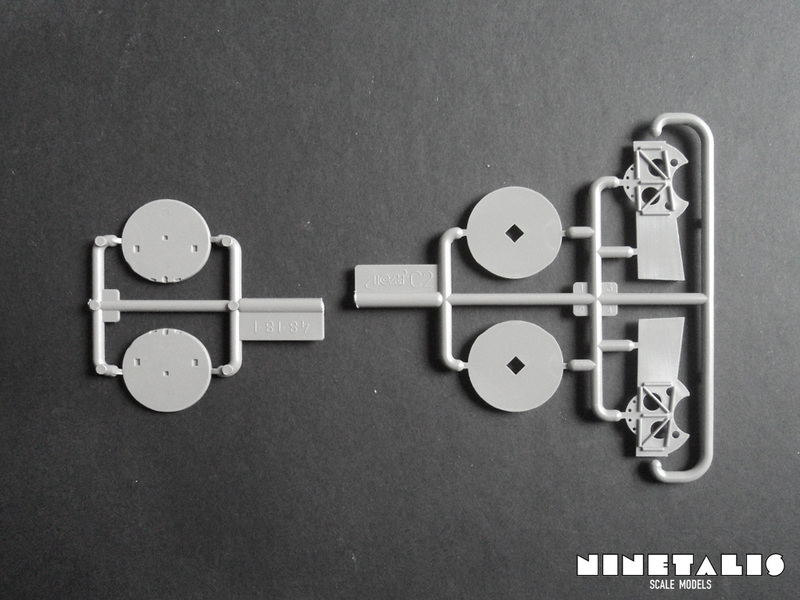 Both the B sprues contain one single part each, which are the upper and lower wing halves. These feature recessed panel lines and heightened details, as well as other details. 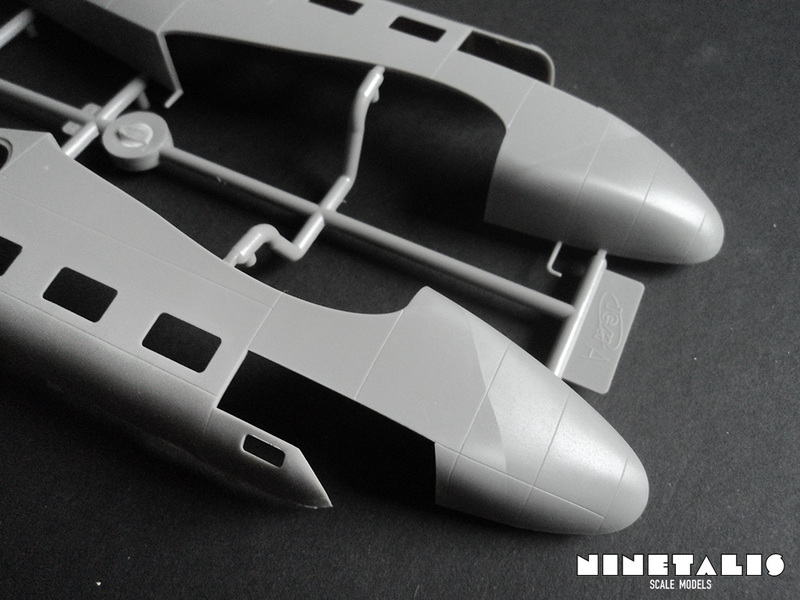 There are some traces of flash on the wingtips, which will need a little amount of clean-up. 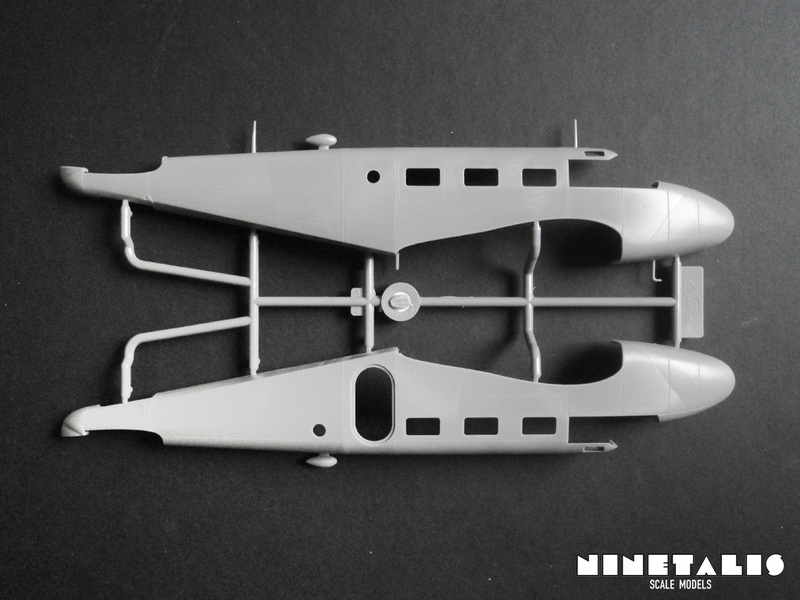 The D sprue is the only big frame we get with this kit. 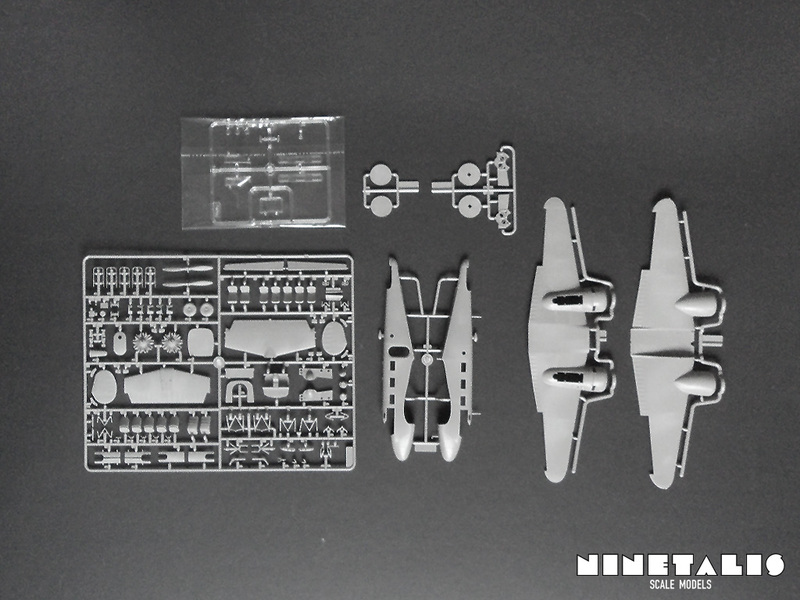 It features pretty much all the details of the kit like the wheels, seats, instrument panel, propellors, engines and many other things. 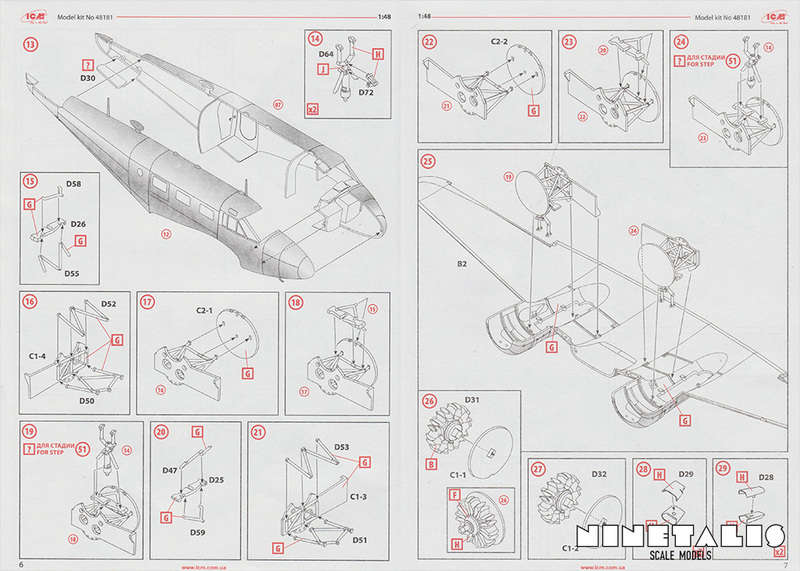 Although that overal the parts are well detailed, it is quite clear that they could be better. The biggest annoyance with the kit must be the undetailed engines, which don’t even feature any detail on the cilinders housings. As the parts for the inside are not very detailed as well, it shouldn’t be the biggest of problems as you won’t be able to see much of it once completed. 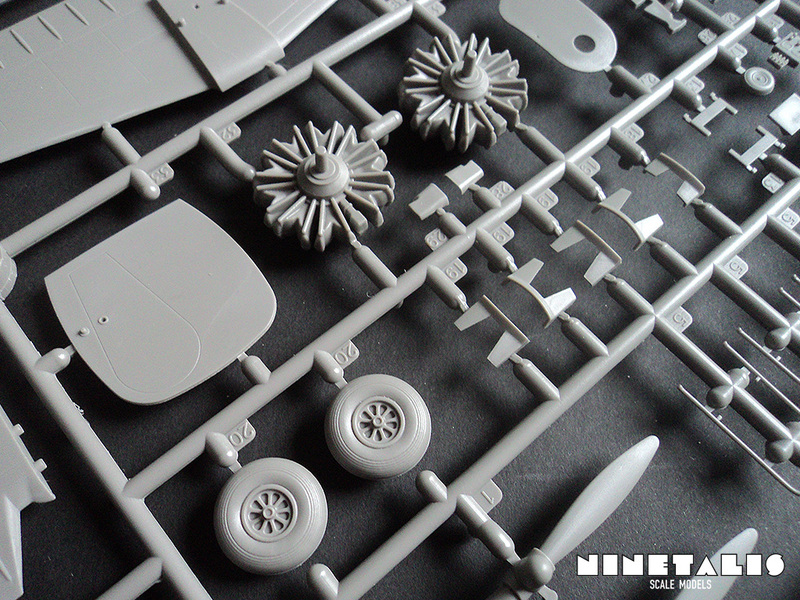 Sprues C1 and C2 both are quite small and feature a few odd looking parts. These are parts for the landing gear and a wall that goes between the engine and landing gear bay. 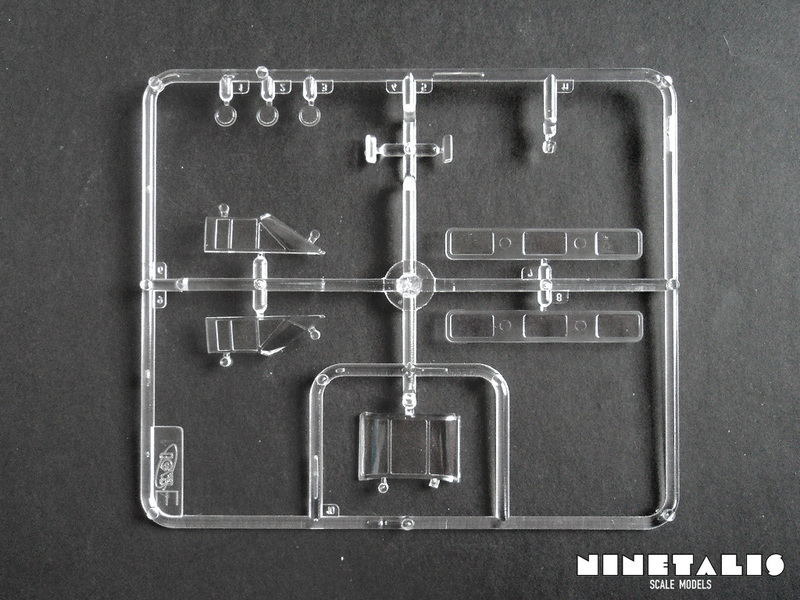 On the clear sprue we can find ten parts. The cockpit windows are split up in three parts, one front windshield and two for the sides. 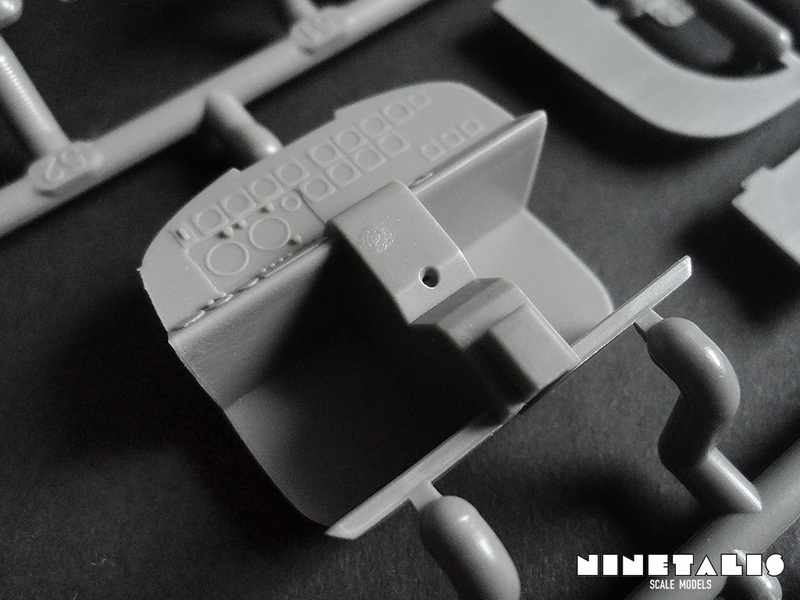 We also have two parts for the square side windows for the passenger compartment, together with a few round windows and other parts that go all around the airframe. 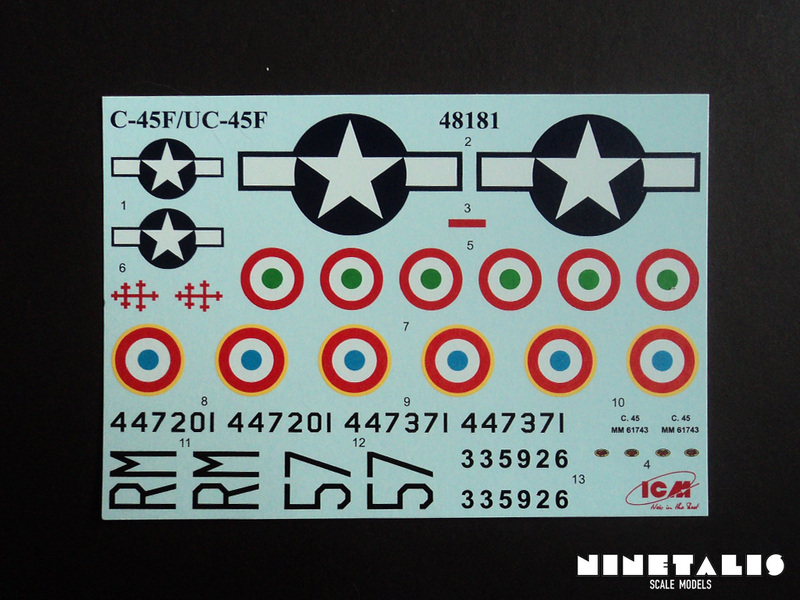 The decal sheet is very small and as said before, does not feature a protective sheet. Because it is stored between the instruction sheet, this might cause damage over time, especially if the kit is stored in a humid area. 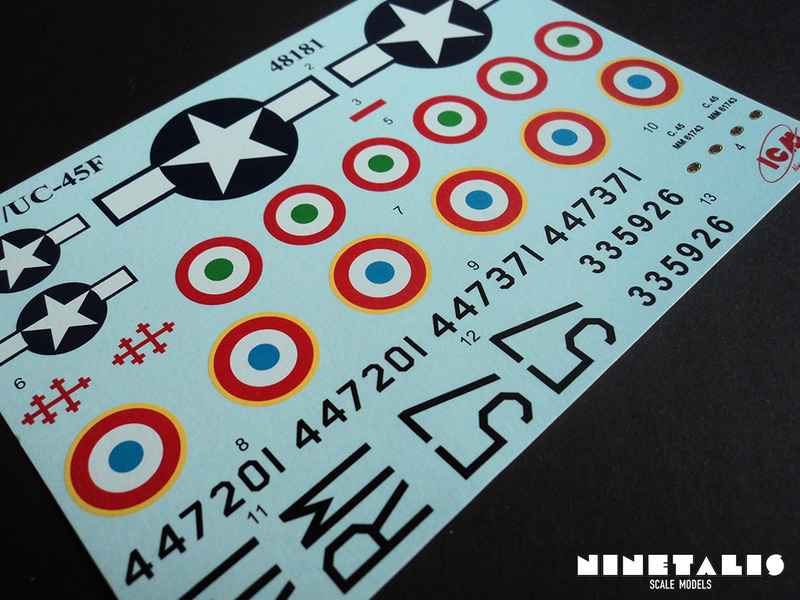 We are provided with markings for four airframes from three different countries, but the sheet does not provide any stencils, aside from the ones for the propellors. Despite all that, I do have to note that this decal sheet has no amount of silvering at all! I just hope this won’t affect the usability of the decals (that they won’t rip in pieces quickly for example). The instructions leaflet consists of a small booklet made up from sixteen pages, which is printed in red and black imagery. The assembly itself is divided into no less than 56 individual steps, excluding a few optional steps. The illustrations that depict each step are computer generated and pretty clear, so it should not pose a problem to understand these. In total we have four different paint schemes to choose from. Two of these are USAF airframes, while the other two are aircraft from the French and Italian air forces. All the aircraft are painted in same way, which is overal polished aluminum with olive drab anti-glare areas. 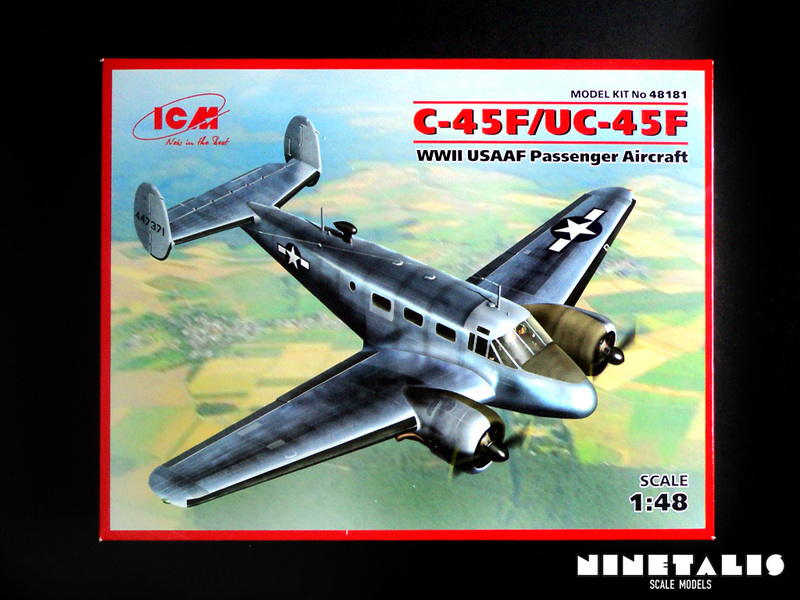 The first USAF aircraft is the same aircraft that can be found on the first photograph at the top of this review and on the box art of this kit. The second USAF aircraft is painted in exactly the same way, but features invasion stripes on the bottom of the fuselage. 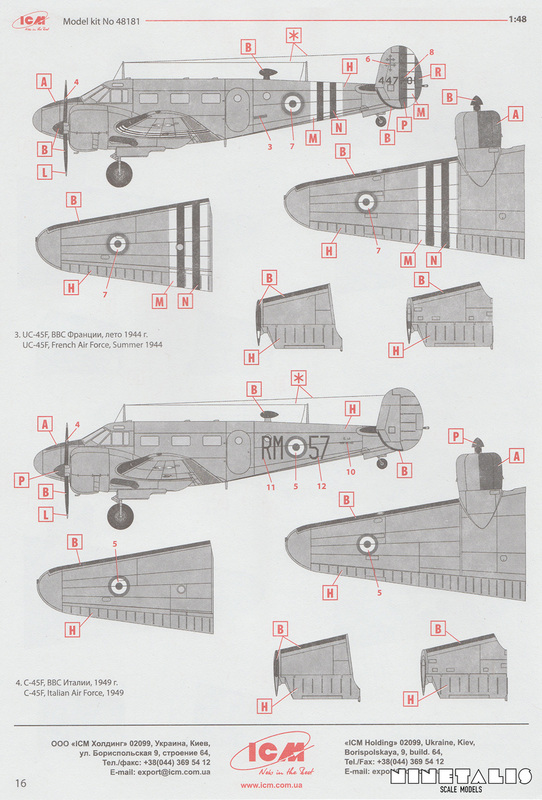 The French air force aircraft features invasion stripes as well, together with French air force insignias. The last aircraft of the Italian air force is the same as the first USAF airframe, but features an Italian insignias and identification codes, but is without a serial number on the vertical stabilisers and rudder. ICM is seriously started to up their game these last years, and this kit is just more proof of it. Not only are they releasing kits of hard to find subjects, but they do it well. It hits almost every note right and there absolutely no reason not to get this kit. 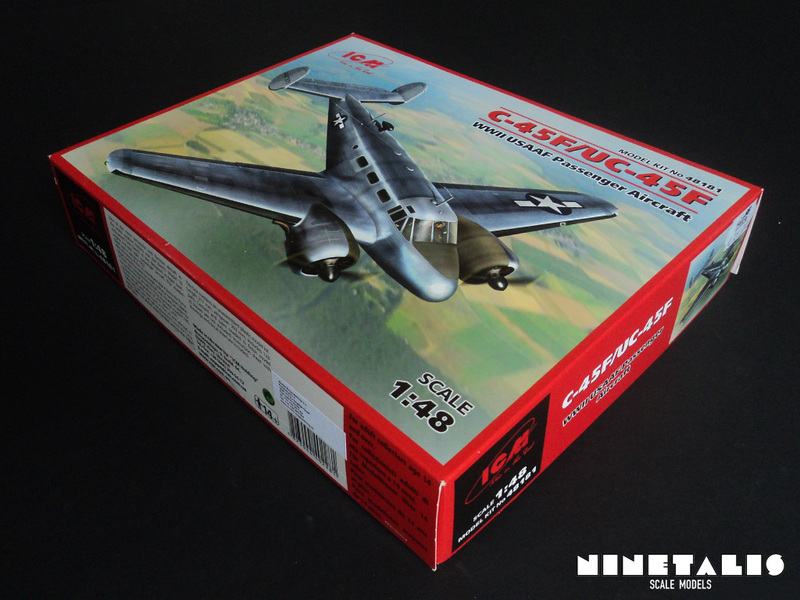 The only downside here is that the amount of detail could be a little bit higher with some parts, but you can easily improve it yourself with a little amount of scratch building, aside from the engines which you will have to replace if you really want something better. Given the price for the size of aircraft that you get, it’s hard to complain. Its definitely not needed to wait for a better kit to come along, as this one will do just fine. Recommended for any level of modeller.